Spramotor Co. Making Munitions Ca. 1916. RC 4935. WWI Photos (Spramotor as Munitions Factory). ARCC. Life in London changed drastically due to the reduced male population and economic adjustments required. 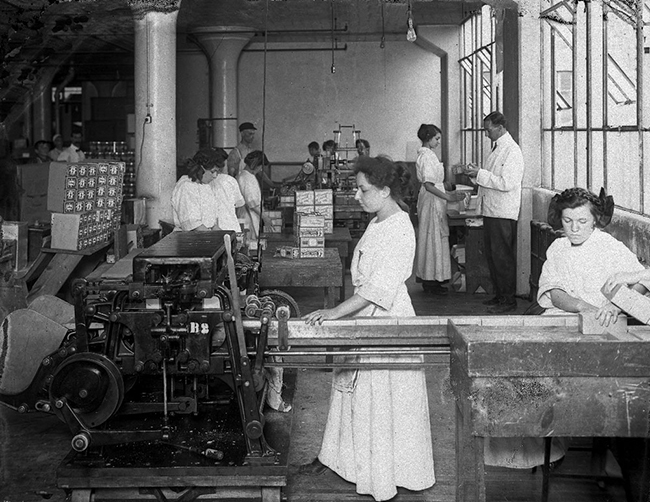 Women entered the workforce in large numbers, filling the positions of absent men. Many became nurses, while others worked in factories or office positions such as clerks and typists for companies like London Life Insurance Company and McCormick’s Factory. Others did their bit by rationing, creating care packages and campaigning for victory bonds. Public schools introduced cadet programs and began teaching agricultural skills. In 1918, the London Free Press called for 25,000 boys to enlist in the “soldiers of the soil” movement which aided food production on farms. 1907. AFC 341-19, Hines Studio Collection, AFC 341-S6-I4, ARCC. Londoners experienced rationing of both food and coal, sparked by drastic changes to the Canadian economy. High prices coupled with inflation resulted in food hoarding and buying in bulk, ultimately causing shortages in the market. Voluntary systems such as “heatless Monday” were encouraged, and the newspaper would often print ‘War Menus’ that restricted the use of rationed ingredients. In 1917, coal shortages headlined the London Free Press as a particularly harsh winter, an overburdened railway system and the United States’ entrance into the war diminished this resource. Those living along the Grand Trunk Railway sent their children out to scavenge for soft coal that came off passing engines. Coal was distributed to companies like Leonard & Sons, and Spramotor Co., which transitioned from manufacturing iron and ‘modern spraying machinery,’ to the creation of artillery shells. The former machined Howitzer shells for the British government. Of the six million shells Canada provided, Leonard & Sons were responsible for more than 250,000. Victory Bond Headquarters in London, 366 Richmond St.
1918. AFC 49.1 RC40006. ARCC. The Canadian government encouraged Londoners to invest in victory bonds and other patriotic war relief funds. Families left in financial despair due to the absence or death of a uniformed member, would receive this relief money. Victory bonds could be redeemed five, ten or twenty years later and many retailers would accept them as payment. In 1917, a three-week city wide canvas took place, and involved the organisation of over two hundred individuals and sixty canvassers who raised $6,505,600.00 for the Victory Loan campaign. By war’s end, voluntary giving in London reached an impressive $466,026.20. However, monetary programs were not the only aid within the city. The Red Cross distributed supplies, shipped care packages, and promoted rationing throughout the country. Lilian Beck, Sir Adam Beck’s wife, ran the London head office, and worked alongside many prominent women. The YMCA also provided aid, however it focused on recreational and religious activities for the soldiers in the city. 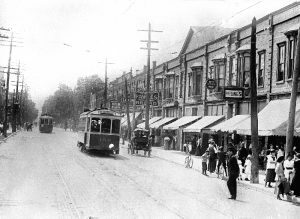 This included a wide variety of services, from refreshment stands to barber shops in tents at Carling Heights. In 1916, more than 10,000 men used these resources at the training camp. 1915. AFC 341, Hines’ Studio Collection, S8-I21, Western Archives, Western University. Accessed 27 March 2017.